All is Grace by Brennan Manning, is on one level a very ordinary biography of a christian "personality". But on a much more important level, it is a life long tribute to God's grace - in spite of alcoholism, divorce, and many other obstacles. The most recent issue of National Geographic celebrates the 400th anniversary of the King James Bible. What perfect timing as we celebrate the first coming of the One who is spoken of in those Scriptures. In more "Bible" news, it was tremendously encouraging to read in Joel Rosenberg's latest email that Israeli Prime Minister Binyamin Netanyahu will soon be hosting a weekly Bible study in his home. Wow. I could hardly believe my eyes. After all these years, the Bible is still revered, read, studied and followed, even by folks who would not call themselves "Christians". At our last staff meeting, Rick, who works in our Bible Reference Dept., highlighted two Bibles that you will want to know more about. The first was the English Standard Version (ESV) Student Study Bible. One of the many preachers who recommends the ESV is Mark Driscoll. I watched him preach from it last Sunday. He has been preparing sermons from the book of Luke for the last 2 years and says that the ESV Study Bible is the best out there. Rick says, "For many people the ESV Study Bible represents the "highwater mark" in study Bibles. Experts like John Piper have called it the "best study Bible ever". However it is massive -- two million words, 2700 pages -- enough weight to make it a chore to carry around. It is also more comprehensive than many people want or need. But.... the ESV Student Study Bible is a great alternative! It is shorter, more fun and basically an edited version of the notes that made the ESV Study Bible the incredible source that it is. For people who want a good study Bible, don't let the word "student" throw you....shouldn't we all be students of the Word?" The second version Rick told us about was the recently updated New International Version (NIV). "Zondervan recently revamped the NIV translation, and they have used this opportunity to expand and revamp their study Bible as well. It is now more colourful, laid out better and more attractive. Don't assume that it is the old NIV Study Bible in a new cover. Check it out!" Full colour maps and illustrations give this well loved and much used version a whole new look and voice. Hear Professor Douglas Moo, Chair of the Committee on Bible Translation share his perspective. A new Bible makes a wonderful gift at Christmas time. Come and see what we have for yourself. It has been awhile since we have posted on this blog. Life here at the store has sped up as the season of Christ's birth has approached. We are happy to resume letting you know about books we love and recommend. The following is from Lando's daughter Aimee. Lando and his wife Kathy own the store and have obviously passed on their love of books to their family. Today while I was at my parents' bookstore I made a great children's book discovery. If you've ever read Brennan Manning, then the theme in this book will come as no surprise to you. It is about God's wide reaching, all encompassing love and how nothing we can do can separate us from it. The story is set in Mexico with a beautiful couple playfully engaging with neighbourhood children, asking them questions, making food together, laughing. The children in the story learn that God is the giver of all good things and that he cares about every part of their lives. 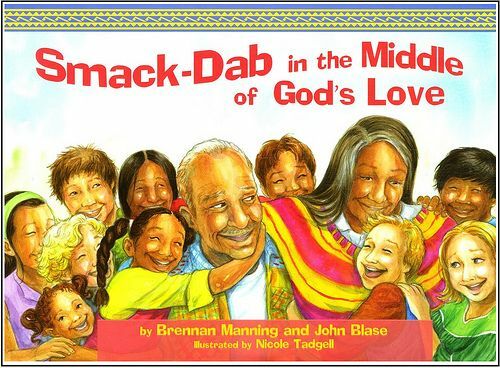 I love the illustrations, the setting, the way the couple relates so respectfully to children, and how God is portrayed. Probably the thing I want most for Anders, Elijah and Eva is that they would know that they are surrounded by God's love. Always. I'm grateful to have found this book to help remind them. This book will be a Christmas gift for our kids, but I can hardly wait to give it to them.